For those who have identified the potential in making the app production process more sustainable, the term ‘low-code development’ might sound familiar. Research carried out by Gartner, which predicted that the demand for mobile applications would outstrip the number of app developers by 2019, still looms large over the mobile app industry. The way CTOs and CIOs cope with the developer shortage could make or break their company’s technological expansion. The second option has given rise to the introduction of numerous platforms, software and agencies which all claim to be a more scalable method for organisations to create mobile for enterprise. For IT leadership, it might sound tempting to want to grasp onto the idea that internal, from-scratch app development will always render better, more innovative results; but the truth is that this artisanal approach is no longer sustainable. Just like websites have moved onto a don’t-try-to-reinvent-the-wheel model, so have apps. For those who have identified the potential in making the app production process more sustainable, the term ‘low-code development’ might sound familiar. It’s a growing industry has risen in popularity, along with ‘no-code development’. But what do these mean or who will actually be using this means of development to create mobile applications? 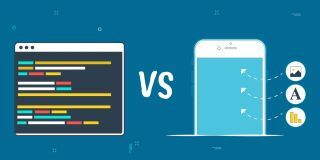 What is low-code and no-code development? Hand-coding applications is a slow and tedious process that only technical specialists can tackle. The introduction of low-code/no-code platforms has put mobile app development in the hands of its end users; generally, line of business employees -- or as Gartner likes to call them, “citizen developers”. Low-code and no-code might sound like a niche market, but the figures show it’s taking over a large part of the IT. According to a 2016 report by Forrester Research, the market for low-code and no-code platforms will be worth $15 billion by 2020. It was only worth $500 million 4 years ago. Why do low-code/no-code platforms make development easier? Are all low-code or no-code platforms equal? As with many pieces of software that fall in the same category, low-code and no-code platforms can vary vastly between one another. Some low code platforms allow you to do things such as design the app’s workflow and build the frontend without much code required, which can then be delegated to less technical users - but when the time comes to create the back-end, developers must step in. Examples of this kind of platform include Appian, Mendix and OutSystems. On the other end of the spectrum, some platforms (hint: like Fliplet) enable citizen developers to create full apps without code, from start to finish. The range of pre-built features includes the most common business applications - such as sharing information, integrating common platforms and such. When specific customisations or processes are required, a developer environment is available and that’s when the developers can take part, should the business requirement be there. This report by OutSystems found most IT teams expect to be asked for no less than 10 apps this year -- some even expect 50. If you’re one of them and you have a very limited development team, then naturally you will be more inclined to get a low-code platform on the no-code end of the spectrum - one that will put more of the work on citizen developers than it does on your own team. If you’re in a heavily tech-based industry, chances are a pre-built app will not cut your needs -- your company will demand unique and innovative technologies, every single time. Hand coding or low code with mostly hand-coded elements will likely be the preferred approach. If you’re pressed for time or requests come from users expecting ever-faster response times, no-code might be best for you. This won’t come as a surprise to IT buyers, but low code platforms can get really pricey. Hundreds of thousands to millions kind of pricey. No code platforms tend to be more reasonably priced. If there’s already a no-code platform specifically targeted at your industry, that can be a huge boon for you and your team. The benefit is that they will offer a range of pre-built mobile app features and use cases that you will have requirements for, so there will be less for you to create from scratch. Fliplet, for example, has a product that’s targeted at professional services, but there are no-code platforms out there specifically for hospitality, retail, healthcare and more. If you’re expected to have new app requirements on a regular basis it might be wise to invest in a platform that allows slightly more customisation, like low-code. If you opt for a no-code platform you may find yourself limited should you wish to incorporate new features or improve your app on a regular basis. Low-code/no-code development platforms have been able to align non-technical professional with technical professionals so that they can learn from one another. This is something that has historically been difficult, with differences between these professionals meaning they work entirely separately of each other. Are low-code/no-code platforms here to stay? They’re the best of both worlds - offering non-technical users the chance to create apps, but ensuring developers can code and access the backend to customise if they wish. Business people have always had a need to solve problems quickly, and low-code/no-code platforms are the latest and most effective solution to do just that. As outlined, the empowering factor of low-code/no-code development platforms mean that line of business employees can put their vision into action, rather than having to rely on other technical professionals to carry out the task for them. If you’d like to learn more about how Fliplet offers the best of both worlds for technical and non-technical users check out our product features which details more on our platform, Fliplet Studio.